Americans profess a certain pride in living without royalty. We drool and gossip about entertainment favorites, whose only claim to fame is that they’re famous, but, gosh darn it, we don’t need royalty. Taking a bath, enjoying the great outdoors. What’s that little smudge of rust on top of your head? Maybe it needs cleaning? 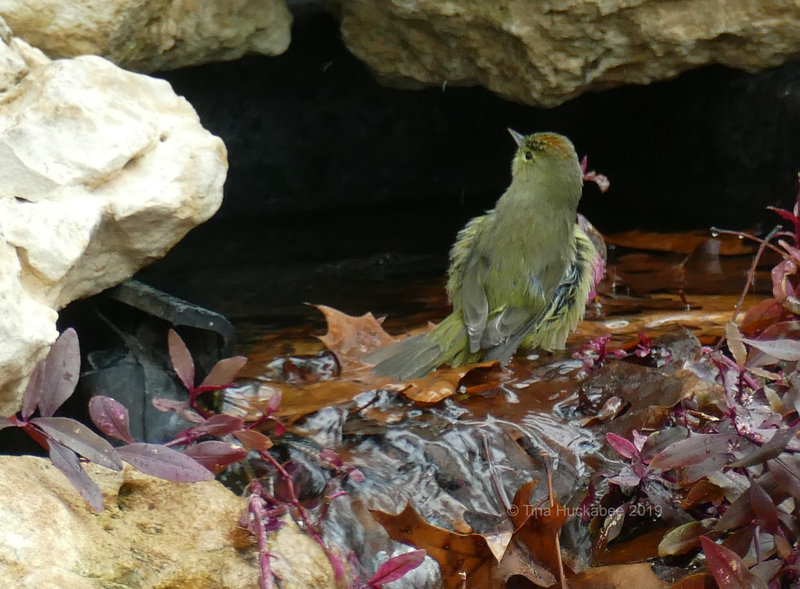 The Orange-crowned Warbler, Oreothlypis celata, is a migrating bird who winters here in Central Texas. Each winter, I enjoy the charm of a few of these busy, quiet but occasionally chirping, little warblers. This winter, I’ve identified two regulars to my garden, though the female is the more frequent visitor. How can I tell the difference? 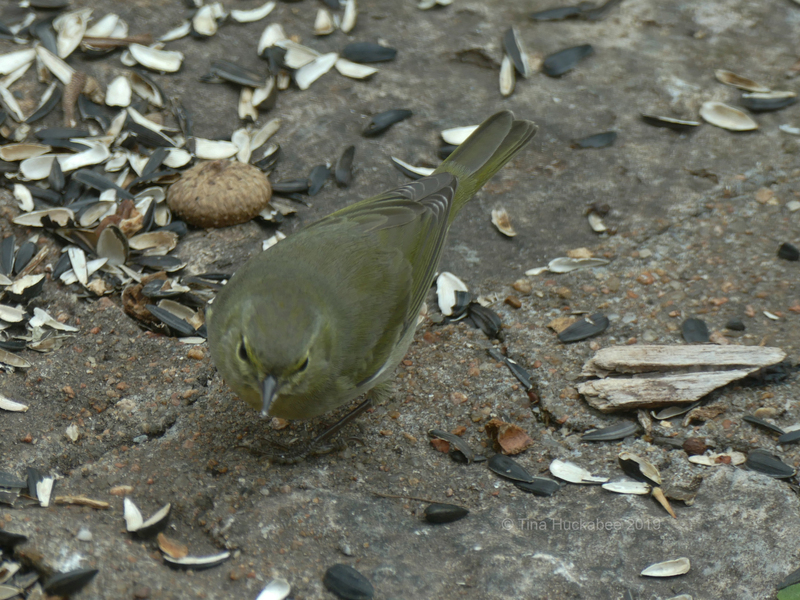 It’s hard with this warbler, as both genders’ coloring is similar–a muted greenish-yellow. According to Cornell Lab and Audubon Society, there are four subspecies of Orange-crown, differing in color, size, and molting patterns. In reading the descriptions of where each type of warbler lives, I’m guessing that it’s the western Orange-crowns, the lutescens, who winter here, as the other breeds either sport more grey, drab plumage or are found only in certain areas. 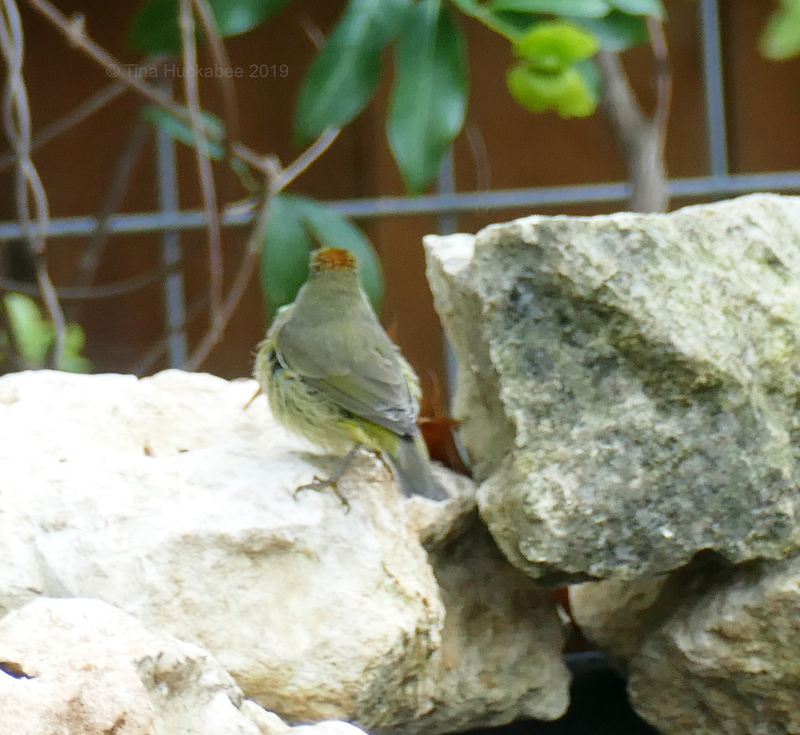 My Orange-crowns are yellow-green, all the time, except for the male and his unsparkly orange crown, which appears when he’s excited, irritated–or taking a bath. Orange-crown Warblers rummage through trees and shrubs, and fluff plant detritus along the ground in search of variety of small insects, spiders, and any source of protein smaller than they are. As Automatic Gardener demonstrates on a recent post, they’ll also visit a hummingbird feeder if given an opportunity. Each fall, winter, and early spring, Orange-crowns visit at my suet feeder; this year, it’s been the female enjoying suet snacks. We all like fat, I guess. I see her almost daily at the suet, nipping at sunflower seeds fallen to the ground, or in the garden, working the shrubbery. I haven’t seen the male in a while, perhaps he headed further south, or maybe he visits a different garden? Was he offended at my catching him at his bath? Stop looking at me, lady! 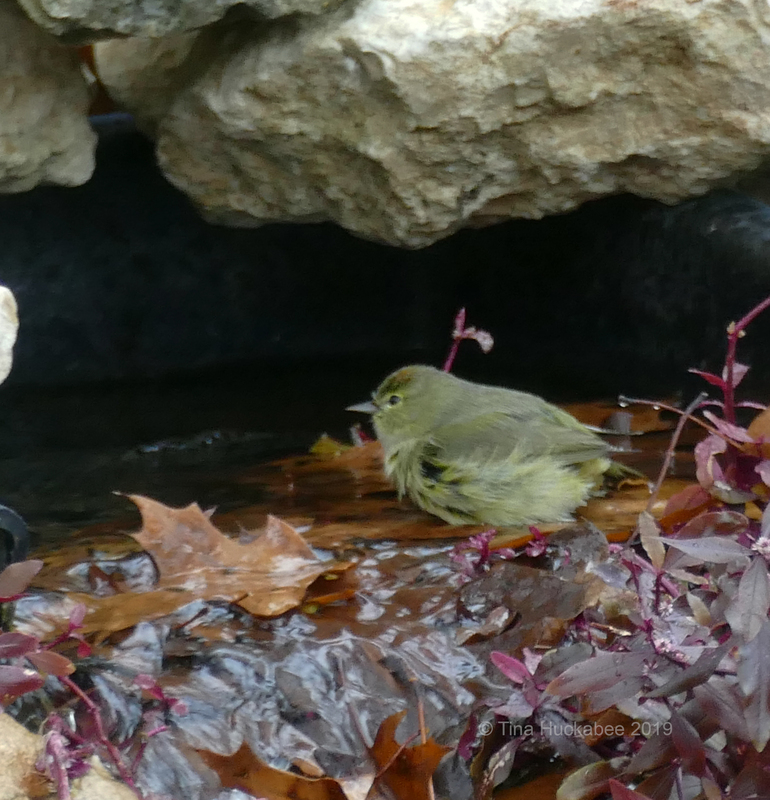 Orange-crowned Warblers are early arrivals during fall migration and hang out in my garden through May. They breed in far north Canada, so they have a long way to go from my Central Texas garden to the neighborhoods where they raise their families. In late summer, after the chicks have fledged, Orange-crowns embark on the big trip southward to their wintering spots. Like other migrating birds, their seasonal treks amaze me: tiny birds who travel thousands of miles, back and forth over continents and sometimes large bodies of water, and that’s normal life for them. How can I not appreciate and admire that? So it goes with birds. 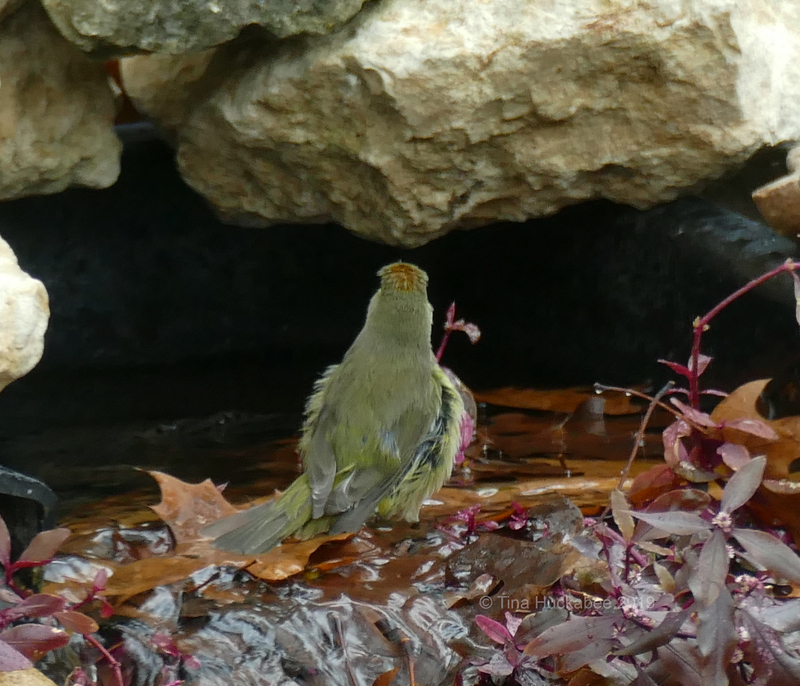 Orange-crowned Warblers, crowned, or not, are royalty in my eyes. 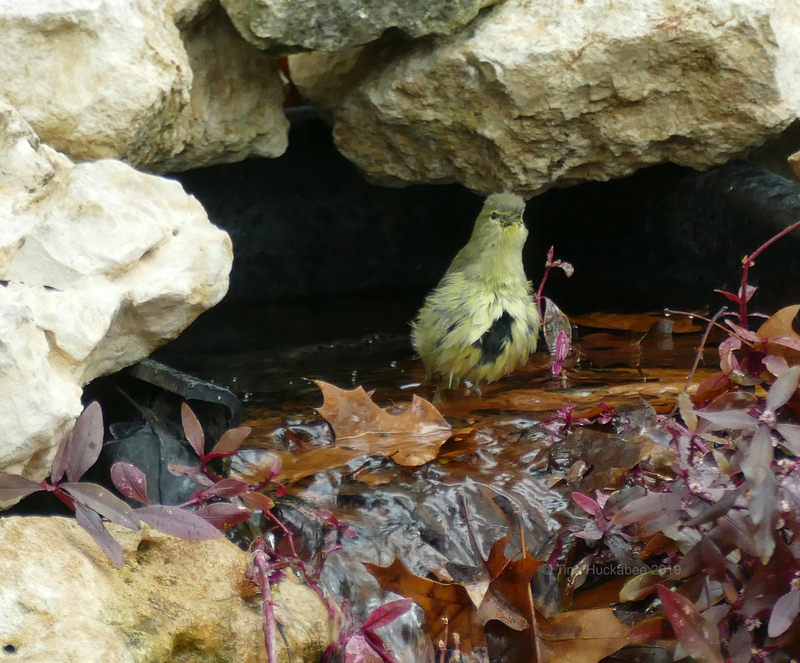 This entry was posted in Orange-crowned Warblers, Uncategorized and tagged Back yard birding, Biodiversity, Widlife gardening, Wildlife Habitat by Tina. Bookmark the permalink. Those last two photos are especially charming and humorous. If I’ve ever seen one of these, I don’t know it. There are a lot of flitty little birds in the woods that I “see” only as a flutter of feathers or some bouncing branches. That’s why your garden, with its water features and shelter, would be such fun — there’s never a lack of entertainment. They’re flitty little ones and subtle in coloring, so it’d be hard to see them unless you’re really looking. One of the things I’ve learned is being aware of movement; I seem to notice movement in the garden when I’m passing by windows, and even, when I’m in the garden. Of course, usually birds are shy when I’m out, so I use my windows as my ‘bird blind’–it seems to work for my observations. Lovely pictures and would love to see more of what the water feature looks like in the landscape! I love the bathing picture. You have a lot of patience to get that shot. 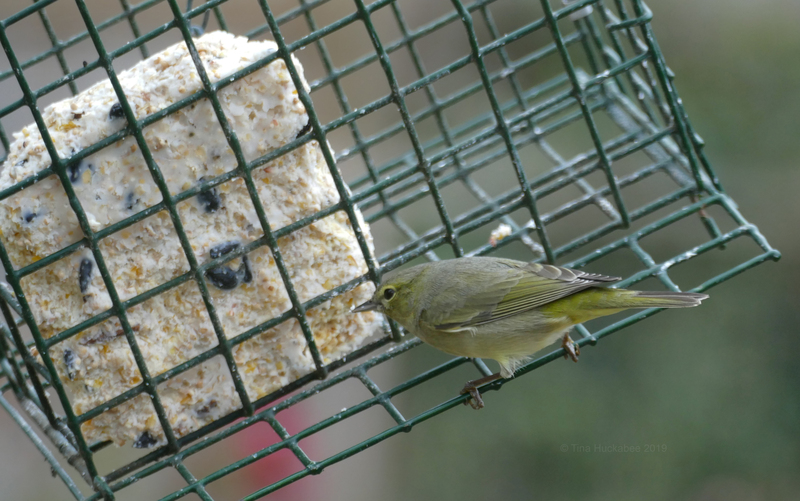 My sugar bird hasn’t been around lately, as the bees have taken over the feeder. It is cold today and maybe the bees will stay in. I’ll keep an eye out for the Warbler today. Thanks, Judy. Honestly, it was one of those situations where I saw movement and grabbed the camera. I was tickled that the orange-crowned was so visible, as that’s a rarety. Dumb luck! Thanks for the link, btw. 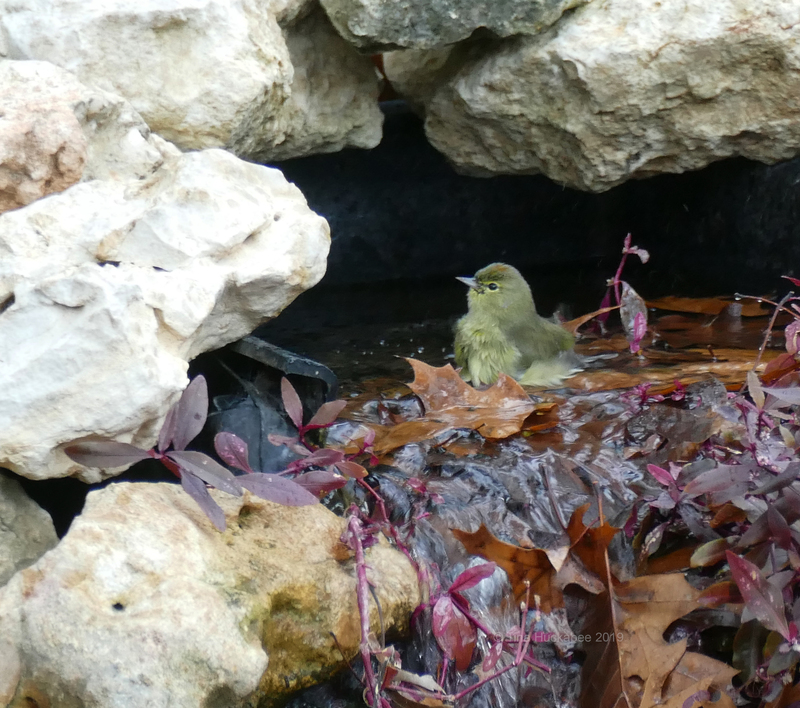 Hope your warbler returns–and the bees, too! Stay warm, we’re cold too, so weird after a warm week. I just saw the warbler. It is too cold this morning for the bees and the bird is taking advantage of the sugar water. I have never seen its crown, which is why I have so much trouble identifying it. Thanks for your help on that. If possible, get a quick photo of the warbler. Even if the photos isn’t stellar, you might (or might not…) get a pic of its head. Sometimes, you can see the smudge of orange on top if it’s a male. Good luck! What a cute couple! Excellent photos, as always, Tina. I especially liked the one where his bath is interrupted… so very expressive! It made me think of a Dr Seuss illustration.. Not sure which, but can you see it too? I does not look like much more than a subdued version of an 80’s do. I would have missed that. Haha–that’s funny! It’s not easy to see the orange–a bit too subtle. Warblers are so subtle in their differences aren’t they? I love it when we get the occasional visitors here (but I usually get someone else to confirm the ID). Of course bath-time photography should be off limits Tina!! What were you thinking? 😉 … but some funny shots. Yes, I guess it’s rude of me to get those shots, but it’s good for a giggle! There’s a whole crew of little yellowish, greyish ones and I find those hard to decipher. Looking at photos taken by professionals is a big help for me, but it still usually takes looking at quite a few. Enjoyed this post … I too am just blown away by the immense distances these small creatures can fly! Thanks for explaining their travels. Aren’t they remarkable? Boggles the mind that any of them survive such long distances–they must have many interesting stories. On the Cornell site, under the interesting facts section, there’s often a blurb about the oldest known bird–some live for years! What a cutie-pie! I don’t remember seeing this bird, but I guess that would make sense because they only migrate through here and don’t spend much time in the Midwest. I’ll have to watch for them during the weeks when the indigo buntings, orioles, and grosbeaks travel north in the spring. Thanks for sharing your beautiful photos and information! Orange-crown are darling. Yes, they probably aren’t in your area for long, but they’re also tiny and hard to see. I usually see them because branches are moving in a decidedly non-wind sort of way and also, of course, at the feeders. Hope you get to see one (or more!) in late spring, probably April/May in your area. What a cute and colorful little bird. But don’t forget the Ruby-Crowned and Golden-Crowned Kinglets, and the White-Crowned Sparrow. I’ve seen a Ruby-Crowned, but only twice and just passing through, apparently. The last two winters, there was at least one, most days. I hope that another shows up before too long. I’ve never seen a Golden-Crowned, but I know they’re here in Texas, just not where I’m looking. The White-Crowns tend to visit as they pass through on their way back to you! Haha–that’s funny. It’s hard to not pay attention to the UK royals, they’re in the news all the time. The Orange crowns are darling–I just love their winter visits, I wish I could enjoy them year-round.